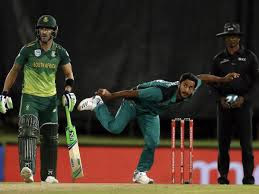 SA vs Pak 4th ODI of Pakistan tour of South Africa 2019 has been played in The Wanderers Stadium Johannesburg on 27 Jan. Get live cricket score and a highlight to know the performances of both the teams in South Africa vs Pakistan 4th ODI 2019. South Africa has a lead of 2-1in this series before this 4th ODI. This series is of 5 ODI matches. Pakistan won 1st ODI but lost 2nd ODI. and the 3rd ODI(DLS). There are so many crickets series have been played in this season. Such as India tour of New Zealand, Sri Lanka tour of Australia, Pakistan tour of South Africa and England tour of West Indies 2019. All the teams are preparing them for Cricket World Cup 2019. Get cricket news and live score of all the matches of all the series in this blog. Pakistan stopped South Africa at a little score 164 runs. So it was easy to get the winning target for Pakistan. Pakistan scored 168/2 in 31.3 overs and won this 4th ODI by 8 wickets. Imam-ul-Haq played a great inning of 77 runs. Fakkar Jaman 44 and Babar Azam contributed with 41 runs in getting the winning target easily.